Kit preview of the Raiden Mecha from Gasaraki. The Gasaraki TV series is about a futuristic ground war between Russia and the JSDF. The series is the brainchild of the man who brought us VOTOMS, in the 80's. That series was remarkable because of its realistically engineered fighting suits, which served as an inspiration to many, including Dream Pod 9 when they created Heavy Gear®. Gasaraki continues that ideal of realism, while tempering the designs with a crisp 90's flair. Lots of hard angles, little atoki-style nuts and bolts and detailing. It's more like a walking M1A1 tank than a typical hip-hop anime mecha! Someone described the suits as "what the Israelis would have if they used mechs instead of tanks" - and that's pretty apt. Bandai's Gasaraki support has just begun. So far there are two kits in the line: The Ishtar Mk.II and the Raiden Armor. When Terry pointed it out to me on HobbyLink Japan I was overwhelmed with avarice ("Must have mecha. Must have mecha..." ... and I'm not even especially a fan of mecha!). Upon opening the box I was amazed at the number and quality of the parts. 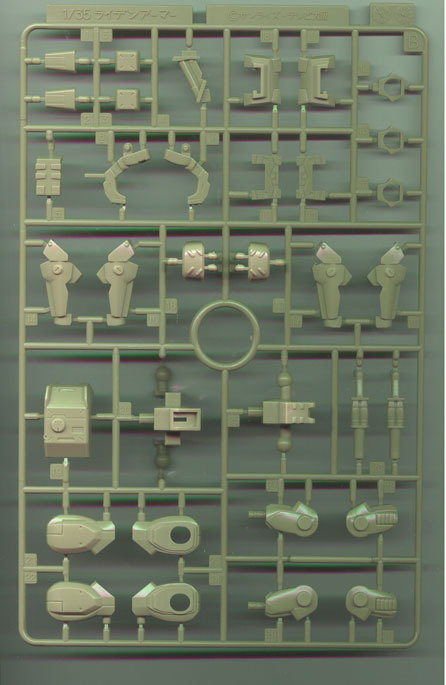 The kit comes with three sprues of over 100 parts and another of rubber joints. What makes this kit shine is all the details. You get a 1" tall "Soldier in Uniform" figure (typical doe-eyed schoolgirl in fatigues) plus a 'hunched over' figure in a pilot suit and VR helmet (and separate arms) that fits in the mecha's torso. There's a fully opening two part backpack-style cockpit hatch which opens to reveal a small control seat that the figure rides like a motorcycle. The cockpit hatches have detail and adding molded into the insides of them as well. The head/helmet area can open up too, revealing the pilot's head poking up through the vision slit in the mecha's helmet. The cockpit hatch even 'slides up' (as if on hydraulics) before you flip it open, a neat touch. Bandai even provides some tiny 4mm long antennae to go on the back of the head, and little 'handholds' and andle-slots on the hatches for a very realistic look! Armament consists of a "75mm Low Pressure Gun", which is basically a giant lance-shaped recoilless rifle with a nicely detailed firing chamber (complete with separate pneumatic recoil compensators) and ammo clip. The plug-in cannon comes with removable barrel which can be stowed under the other arm while the mech is running or being transported. A second ammo clip is provided which plugs into the opposite side of the cannon, allowing you to pose the model with the gun under either the left or right arm. There are also two 'pull off' weapons panels on the forearms where you can plug in two 50mm grenade launchers. Next, there are Patlabor-style 'shock/stun' prods that plug into the mecha's knees, two 'retracted' and two extended. Finally, you get two sets of fists and two sets of 'open hands'. Another neat touch, for those that maybe a put off by the challenge of painting all this detail, is that the kit is molded in color - and not the cheesy bright plastic colors we know and love. The main armor components are molded in a flat tan; weapons and internal bits in a flat blue. You could get away with painting only the figures and have a stellar model ... but where's the fun in that? There's details on top of details that beg for washes and drybrushing. You also get a small sheet of subdued, stencil-type tactical marking stickers, allowing you to build units #1-#4 as (I assume) seen on the show. The wealth of articualtion, detail, and optional parts means the possibilities are almost limitless for displaying this beastie. If it was made by an American company you couldn't touch it for under $30 - but Ban Dai's kits go for about $8.50 USD, each. For that price, I'm gonna get a pile of 'em! If there's a downside to the kit, it's that the instructions are in Japanese. 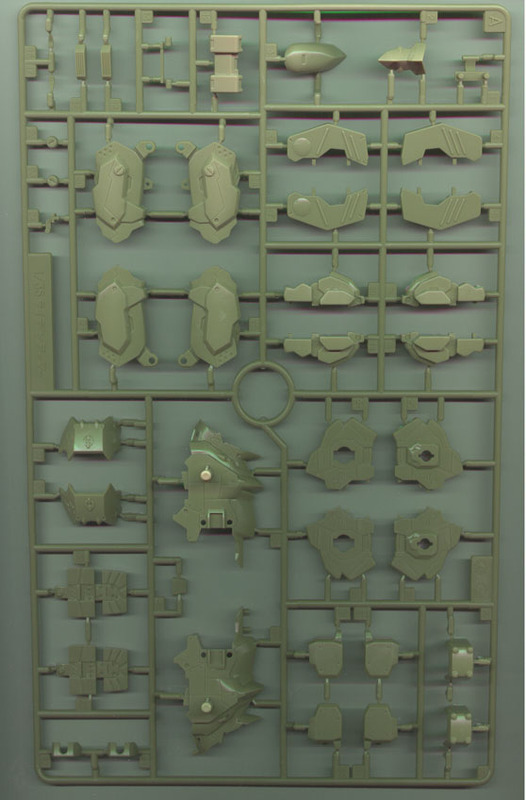 However, the pictures are pretty clear as to what goes where, all the parts are numbered, and they provide several full color views of a completed model in various poses. Most builders with a kit or two under their belt will have little trouble figuring out how to assemble this one. This page copyright © 1999 Starship Modeler. Last updated on 24 March 1999.